Krishidhan is 100% holding company of two other companies in the group. KRFPL came into existence on account of separation of R&D activities from Krishidhan in 2007-08. As on date it is a 100% subsidiary of Krishidhan and operates under the expert guidance of eminent scientist. The Group is one of the first few companies in the Seed Industry, which has recognition of Department of Scientific and Industrial Research, Govt. 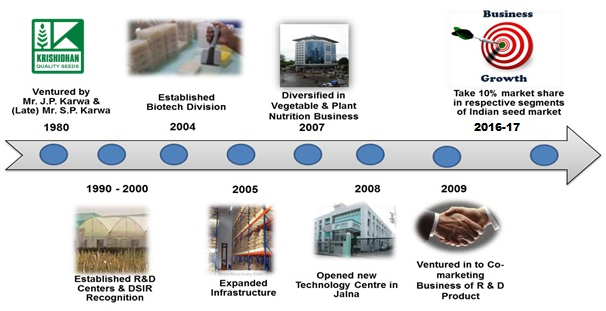 of India and has achieved significant development in GM Seeds. The Group’s R & D philosophy is “KRISHIDHAN RESEARCH – PROACTIVE NEED BASE RESEARCH” and so the group have sizeable investment in R & D which in turn has helped Krishidhan to produce superior products to meet the changing customer needs. Taking a step further, the group has entered into collaborative research projects with many national and international companies & agricultural institutions. 100% subsidiary of KSPL and is basically engaged in the development of agribusiness Opportunities and marketing of agri-input products.